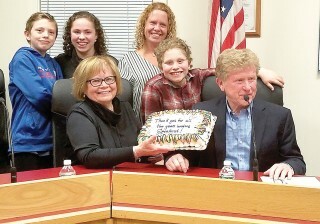 Senator Bill Diamond appeared to be surprised by the crowd of family, friends and supporters who filled the chamber room at the Windham Town Hall on Thursday, March 28 where the monthly “Speak Out” is filmed and recorded. He may or may not have been aware that those present received the word and wanted to be there to support him and see him off for his last hosting hoorah. Senator Diamond is retiring. signed off as host of Speak Out. To be very clear, the greater Lakes Region Senator whose district includes the towns of Baldwin, Casco, Frye Island, Raymond, Standish and Windham is not retiring from his role as senator. He’s just simply stepping down as the host of Speak Out. “When David (Gallagher) told me he was retiring, I thought about it and decided it was a good time for me to retire from Speak Out, too,” Diamond said. Gallagher is the producer of Speak Out. The first part of the hour focused on the Windham Community Center project that has been in the works for the past couple of years. Guests on the show included Pat Moody, who chairs the Community Center Committee as well Joe Crocker, a Windham resident who is also as a member of the committee and works as a Program Coordinator for the Lewiston Parks and Recreation Department. The second half of the hour-long show was dedicated to reminiscing the past 29 years. Long time Windham resident who was the creator of Speak Out, Jim Cobb and Dave Tobin, a past state representative from Windham, joined Senator Diamond. Cobb and Tobin offered a variety of memories. “Bill, you have done almost everything,” Tobin said. And then he proceeded to list the multitude of activities and career titles that Diamond has occupied. Briefly, Diamond was selected to the Maine House of Representatives in 1976 and served in the House until 1982, when he was elected to the Maine State Senate. He served in the Senate until 1986. In 1989, he succeeded Rodney S. Quinn as Maine's Secretary of State and was re-elected four years later. He returned to elected office in 2004 when he was elected to the Senate. Unable to seek re-election due to term-limits in 2012, Diamond was replaced by Republican Gary Plummer. In 2014, Diamond again ran for the State Senate, this time in the Windham-based 26th district in Cumberland County, and was elected to a seventh non-consecutive term. Diamond taught at the Windham Public Schools from 1968 to 1986 and in 1986, he was school superintendent of the Raymond Schools. He was also a member of the Windham Land Trust (now Presumpscot Regional Land Trust). He is on the board of Neighbors helping Neighbors program, on the board of the Maine State Society for the Protection of Animals – and the list goes on. The Speak Out program will continue. Diamond approached both Representative Mark Bryant and Representative Patrick Corey to be the new hosts. Rep. Bryant declined in order to focus on family commitments. Rep. Corey has accepted and will be the new host. “My biggest hope is that I am able to find topics that Windham’s people find interesting,” Rep. Corey stated. When asked how he felt about filling the role of the Speak Out host, Corey joked, “Well, I have some pretty big cowboy boots to fill,” referring to the fact the Sen. Diamond is known for often wearing his favorite cowboy boots. The evening ended with a celebration of cake and ice cream as Sen. Diamond said his last goodbye as the host of Speak Out. The next Speak Out will be on Thursday, April 25 at 7 p.m.